Apple has always found itself being associated with the word ‘magical,’ especially where the iPad is concerned. As this magician reveals in his act that he pulls off with an iPad as a prop, Apple has clearly not hit that note enough. Head over the jump to watch him pull some truly amazing tricks on a live show. Simon Pierro is a critically acclaimed German magician and enjoys a reputation that follows him since over 15 years now, but his recent works have made him a popular figure on the blogosphere in a short period of time with tricks that center around the iPad or iPhone as a prop. And as he proves live on The Ellen DeGeneres Show, this guy is to be taken seriously, given the mix of technology and sleight of hand employed in his tricks. 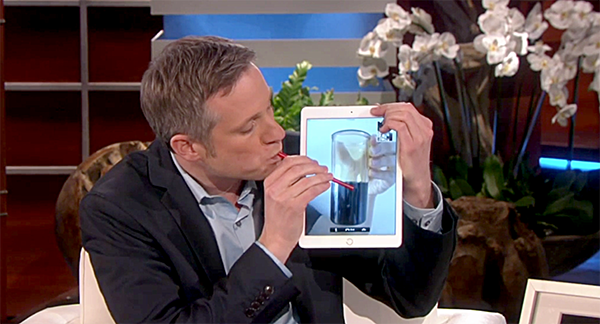 On The Ellen DeGeneres Show, Pierro is literally seen pulling things out of the iPad, with the best example being a printout of a selfie that he had just taken with two audience members using the iPad. Some custom designed animations, or apps are obviously going hand in hand with the acts being performed, but the sheer spontaneous movement of objects between the physical and digital world does leave one dumbfounded for a moment. Pierro despite his earlier works is now being dubbed as ‘The iPad Magician,’ and a “digital magician without parallel”. The iPad Magician has an incredible 80 million hits on his online videos, and given his new-age performance with a device that everybody loves, his unique performances are bound to leave quite a few viewers enamored with the iPad. I mean honestly, this guy should be crowned the brand ambassador for Apple’s ‘magical’ tablet. Perhaps Apple’s biggest success with the iPad is how the tablet has become part and parcel of the pop culture, where the famed slate has been the choice of prop for plenty of digital magicians and tricksters in the past, although Pierro does operate in a league of his own. You can check out more videos from ‘The iPad Magician’ on his blog, which is filled with more tricks, including acts with the iPhone as well. Let us know what you think about the magic tricks in the comments section below. Wow…That video left me speechless. It’s amazing all the tricks he did with just the iPad! Amazing. I love it. I don’t know how he did some of that stuff.